It’s hard to put it into words, but Matt Kindt changed my life. More specifically, he changed the way I look at comics and gave a jump start to my love for the medium. This all started with Pistolwhip. I already knew I loved comics and I understood that I devoted more of my time to this one passion than anything else in my life, but Pistolwhip opened my eyes in a way that no other comic has. I grabbed The Complete Pistolwhip on a blind gambit during one of my boredom-induced bank account-slaughtering trips to my local comic shop. I was in a dangerous place, mentally and financially. I had read nearly every issue and trade in my possession and nothing at the comic shop was catching my eye. When this happens, I have one recourse, as terrible as it is: I just start grabbing things at random. I grab as many comics as I think I can handle then I grab a few more for good measure. I must have bought a dozen trades and a handful of new number-ones that day in addition to Pistolwhip, and I grabbed Pistolwhip because the presentation — the cover illustration and the beautiful hardcover binding — was mesmerizingly beautiful. I took that stack of comics home and pored over Pistolwhip immediately. Once I finished it, I slid the rest of the comics I’d bought that day onto an empty shelf and left towards the comic shop again, except this time I was more focused. I bought anything and everything by Kindt I could find: Revolver, Super Spy, 3 Story, and as many issues of MIND MGMT I could fit into my grubby mitts. I was infinitely excited to grab up Dept H, Kindt’s new comic featuring the monthly-format debut of his wife, Sharlene Kindt. Based on the first issue alone, it would be difficult to sum up the story of Dept H in a way that sounds complete. In the most simplest terms, it’s a bottle mystery, wherein an outside investigator — Mia — is called in to a sealed research facility on the ocean floor to solve a murder. But there’s so much more going on here than an isolated whodunit. 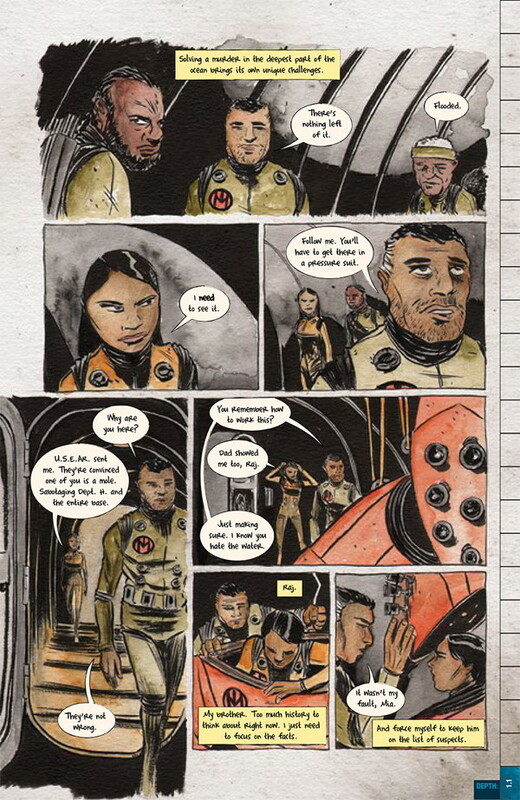 In the span of twenty-eight pages, Matt Kindt cleanly and effectively introduces all of the key players, and not all of them are on the ocean floor. On the surface, there’s Phillip, the head of the Underwater Science Exploration and Research — a kind of government organization overseeing the titular sub-oceanic research facility, Dept H — who is motivated more to protect the viability of his organization than to actually see that the murderer is brought to justice. Along with him are Blake Mortimer, the money behind the operation and a lifelong friend of Mia and her family, and Alain, a former lover of Mia’s who now oversees all operations at Dept H. Within the facility itself is a conglomeration of conflicting personalities, including Mia’s brother Raj. It would be easy to file this story as a genre-mashing sci-fi murder mystery and be done with it, but to do so would be incredibly careless because all of the action takes place below the surface. In the middle of all of the soft science fiction (the very notion of a research facility at the bottom of the ocean almost serves as high fantasy alone, before the pressure suits and compounds built on the surface of the ocean) and the lineup of suspects is a very real human drama. Mia is conflicted with her relationship with her father and, in effect, her relationship with her brother. The people she has been sent to investigate are people she knows: a former friend, her father’s former business partner, et cetera. Watching Mia begin to navigate these social and familial territories in her new capacity as investigator is almost as thrilling as watching the science fiction play out, and watching the human drama intertwine with the genre fiction will be the true gem of this book. More than anything I’ve read from Kindt — and again, coming from a very small sample size of one issue — this is him bringing his absolute best to the writer’s desk. 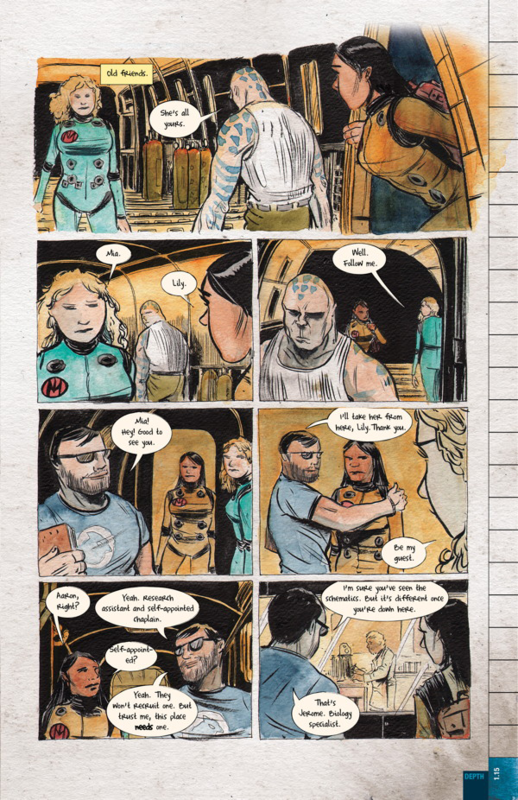 Matt Kindt hits it out of the park on the art side, as well. I’ve always felt that his artwork is something special that transcends description: every line in every panel is exactly as it should be, with only enough detail as is necessary. The artwork looks neat and streamlined and doesn’t strain the eye like a lot of modern hyper-detailed line work can tend to do. Each character is so precisely defined and recognizable by their first appearance and the settings explored by Mia and the others look as technological and mysterious as they need to. The best part of Kindt’s artwork, though, isn’t just the alarmingly bizarre creatures or the wondrous technologies or even the gloomy moods set by Dept H’s futuristic corridors. Instead, it is the expressions worn by each character. This is a comic in which you could cut out the captions and dialog bubbles and, while you might not get the exact idea of whats happening, you’ll still get the feelings: the romantic awkwardness between Mia and Alain, the distrust and betrayal between Mia and Raj, and apathetic disinterest of the Dept H bodyguard, Q.
I would be failing you deeply if I didn’t take a moment to talk about the tremendous contribution by Sharlene Kindt in her colors. I’ve seen a lot of comics painted with watercolors and I’ve always loved the effect. If done right, watercolors can enhance the moods and tones of any story in any setting. Sharlene Kindt must have sold her soul to the devil because her colors in Dept H are beyond just being done right. The colors seem to work in tandem with the ink, contrasting the stark precision of the lines with a hazy, almost dreamlike quality. The colors and their inherent artistry and effectiveness are easily one of the best quality of the books, from the dreary oranges of Dept H’s interior to the light blue washes of the flashback sequences to the deep and murky shadows of the ocean floor, every color becomes a part of the scene. In fact, the only complaint I can find in this book is in the lettering. It’s not a complaint I often have — I don’t remember every buying a comic and being alarmed by the letters — but it is an important one. In an ideal situation, the letters, speech balloons, and captions should work in line with the art. At Matt Kindt’s best, particularly in Pistolwhip, the dialog and sound effects are drawn into the panel themselves, actually integrating into the art and becoming one with the lines. As far as letters go, though, this isn’t Kindt’s best work. The balloons and captions seem to stand on top of the art, almost as if they were pasted on as an afterthought, and the lettering itself seems reminiscent of a Blambot font used on a webcomic. The overall effect is nothing short of distracting. For the first few pages, I felt my eyes wander from the artwork, which is otherwise stellar, to the placement and presentation of the text. Never, unless for a very specific and well-defined purpose, should the lettering distract from the artwork, yet in Dept H, I actually had to train my eye to ignore how out of place it felt. All in all, though, if you’re able to glaze over text and lettering and don’t have trouble focusing on the broader effects of each page, you won’t have a problem, and the otherwise spotless excellence of the rest of the comic will be more than enough reward for taking your time. 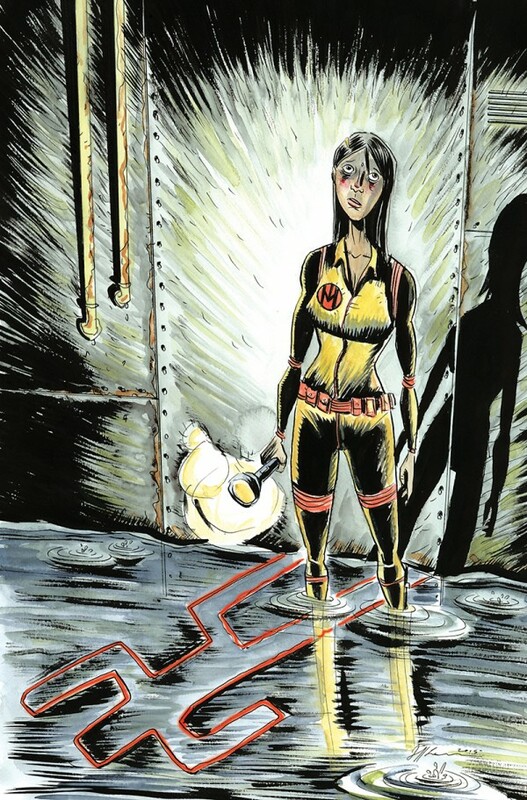 Matt Kindt is a special creator in comic, and his work is important to me. He changed the way I look at comics and, in doing so, gave me a completely new vantage point to the medium I love the most. With Dept H, he’s building on that, determined to defy expectations and approach each subject from a unique direction. If it isn’t already, put Dept H on your pull lists now.